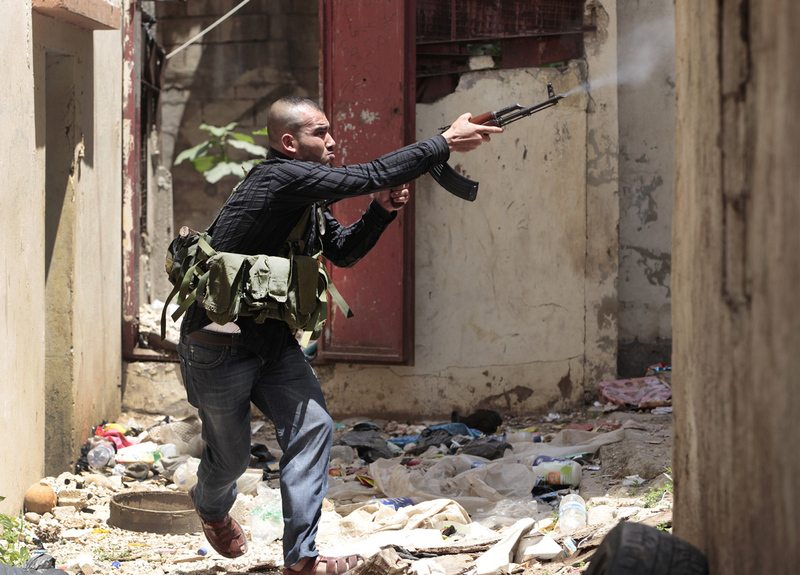 (AP) TRIPOLI, Lebanon - The uprising in Syria fueled intense clashes in neighboring Lebanon for a third day Monday, with gunmen firing assault rifles and rocket-propelled grenades as sectarian tensions spilled across the border. At least four people have been killed in Lebanon's second-largest city, Tripoli, since the gun battles erupted late Saturday. Lebanon and Syria share a complex web of political and sectarian ties and rivalries, which are easily enflamed. The revolt in Syria began 14 months ago, and there are fears the unrest could lead to a regional conflagration that could draw in neighboring countries. The U.N. estimates the conflict has killed more than 9,000 people since March 2011. Syria is overwhelmingly Sunni, but the country's President Bashar Assad and the ruling elite belong to the minority Alawite sect. The uprising has exacerbated Sunni-Alawite tensions in Lebanon, as well, sparking the clashes in the northern Lebanese city of Tripoli. The clashes began late Saturday after authorities detained Lebanese national Shadi Mawlawi, an outspoken critic of Assad. Military prosecutor Saqr Saqr charged Mawlawi on Monday and five others, including a Qatari, a Palestinian and a Jordanian with belonging to an armed group and carrying out armed acts inside and outside Lebanon, judicial officials said. The officials spoke on condition of anonymity because they were not allowed to speak to the media. The arrests apparently enraged the Sunni population supporting the uprising, and clashes soon erupted between Sunni fighters and Alawites who support Assad. Tripoli's Bab al-Tabbani neighborhood is overwhelmingly Sunni and posters supporting the Syrian opposition hang on walls, and pictures of a local activist shot by a sniper in similar clashes in February read "Greetings to the free martyrs of Syria" and bear the Syrian revolutionary flag. The fighters are clear about the root of the conflict that has them shooting at their neighbors. "Syria. It wants it this way. It wants to start a battle here so it can say, look, even in Lebanon the Sunnis are killing the Alawites," said Mustafa Nashar, 35, whose family lives in an apartment overlooking Syria Street, which cuts through the neighborhood. Groups of men, many of them carrying assault rifles and wearing military-style vests ducked Monday through trash-strewn alleys. The residents who have remained in the neighborhood take cues from fighters about when to sprint across alleys to evade the snipers up the hill. A car with children crouching in the back sped past one alley, a bullet pinging the pavement right behind it. The Lebanese army set up a small position a few hundred meters away from the fighting, but there was no sign of soldiers or police in the immediate area. Resident fighter Mohammed Jaber, 49, said such local fighting in Tripoli has been going on for decades and that the Syria unrest set them off again. "The old has become new," he said. "Once the Syrian revolution started we supported all efforts to get rid of the regime." Syria's uprising started in March 2011 with protests calling for political reform, but a relentless government crackdown led many in the opposition to take up arms. Some soldiers also have switched sides and joined forces with the rebels. World powers have backed the peace plan for Syria, which was put forward by U.N.-Arab League envoy Kofi Annan, but the bloodshed has not stopped. More than 100 U.N. observers have been deployed in Syria to oversee the truce between the government and armed rebels. On Monday, Syrian troops shelled the rebel-held town of Rastan, sparking intense clashes that sent bloodied victims flooding into hospitals and clinics, activists said. The violence in the restive central Homs province and elsewhere around Syria is eroding Annan's peace plan that many see as the last hope to calm the crisis. An amateur video showed a young girl who apparently suffered shrapnel wounds in her thigh undergoing treatment in a makeshift Rastan hospital while screaming in pain. Asked where her mother was, the girl cries: "She died!" Another video showed four dead men half their bodies covered in a green sheet. Rastan, just north of Homs, has been under rebel control since January. The Britain-based Syrian Observatory for Human Rights and the activist network called the Local Coordination Committees said the latest shelling of Rastan started on Sunday. Rami Abdul-Rahman, who heads the Observatory, said the rebels were able to destroy several army vehicles during the clashes and kill soldiers. The accounts could not be independently confirmed. The attack on Rastan came after Syrian forces killed at least five people when they raided a Sunni farming village in Hama province, torching homes and looting shops in what appeared to be a sign of worsening relations among the country's religious groups. Also Monday, the Observatory and the LCC said government troops stormed the Damascus suburb of Qaboun where they conducted raids and deployed snipers on roofs of buildings. In Brussels, The European Union imposed visa bans and asset freezes against three people associated with Assad's government. The measure brings to 128 the number of Assad's supporters targeted by the bloc. In Damascus, state-run TV said the results of last week's parliamentary elections will be made public Tuesday. The government has praised the vote as a milestone in promised political reforms, but the opposition boycotted the polls and said they were designed to strengthen Assad's grip on power.